D. 1520 at Buried at Monivaird Ref. 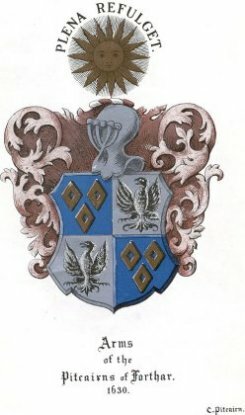 Margaret, second daughter of Henry tenth Lord of Pitcarne and Forthar, married David Murray of Ochtertyre, whose family was one of the noblest in Scotland. Anothony got a lease of the lands of Dollarie and was first of that family. Mitchel got the lease of the lands of Coig. Patrick was killed at Flodden 1513 eldest son. Charter by James IV King of Scots, to Margaret Petcarne, wife of the late David Murray, in life rent, and to her son Patrick Murray and his heirs-male in fee, of the lands of Uchtertyre and Correglen, in the lordship and stewarty of Stratherne and Sheriffdom of Perth. Dated Edinburgh 4 Feb.1509-10.